Dr. Jaclyn Bradle grew up just a few miles from Rancho Cucamonga. During high school, she ran cross country and track competitively. After high school, she moved away from home and received her bachelor's degree in biopsychology from UC Santa Barbara. Dr. Bradle entered UC Santa Barbara as an undecided major, but knew that she wanted to be part of the medical community and help others. It was during these college years that she began interning at a medical hospital. Dr. Bradle will tell you that it was a lost retainer that brought her into dentistry. Since she was the only person in her dorm hall with a car on campus (anyone in SB can get by with only a bike), she gave a ride to a friend when they lost their retainer at the lunch hall in the infamous napkin tossed into the trashcan trick. Picking up the yellowpages and randomly finding an orthodontist in the area, he squeezed them into his schedule at the end of the day. Being his last patient, he chatted with her and her roommate about their lives at UCSB and majors. Hearing that they were undecided, he invited them to intern with him over the summer since he loved his profession and thought they would too. Dr. Bradle took him up on the offer and fell in love. Dr. Bradle noticed right away how different this dental community was from the hospital she was interning at. Their were big differences, but one thing was the most important. She quickly realized that the doctor and staff at this office actually knew their patients and had relationships with them. They knew the patient's families as well. She was immediately intrigued by the idea of helping others, but knowing them as well. Dr. Bradle loves this fact and has never let it go. 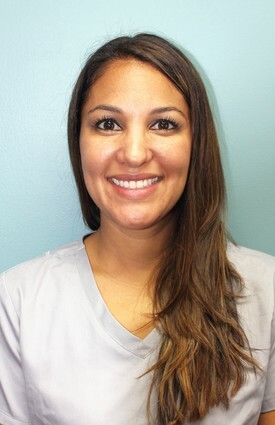 When Dr. Bradle began dental school, she found herself smiling thankfully at the opportunity she had been given and has never forgotten what brought her into dentistry. University of Southern California was the beginning of a lifelong journey dedicated to dentistry and the patient's lives she can positively affect. Dr. Bradle feels like medicine has lost its way over time. Gone are the days of the family physician. In dentistry, however there can be doctor patient relationships. Dr. Bradle was attracted to Dr. Shryer's office due to the old-fashioned patient care given and long time relationships with patients. Although, Dr. Bradle believes in old fashioned patient care, she knew that merging this with new technologies was the best way to care for her patients. Using digital radiology, she has decreased the radiation exposure to her patients for x-rays. Using electronic health records, she is better able to keep track of patients medical histories, dental complications, and keep them informed of their dental health status. Having customized music or netflix available to patients while having their routine cleaning or work done, also helps to put the patients at ease and makes the dental visit a little less stressful for them. Today, Dr. Bradle lives just outside the Rancho Cucamonga area, with her husband and three young children. She feels that being the mother to three young children has given her the advantage of empathizing with patients, their fears, and imagining things from a child's perspective. She believes that everyone deserves quality comprehensive care from the 6 month old that just got their first two teeth to the 90 year old great grandmother. Her compassion allows her the ability to treat the entire family and become the dentist that they grow up with and bring their family to as well.